The Mueller® Waterworks Product Training School is where you can learn the latest about Jones® and Mueller products, field tips, installation techniques and maintenance procedures. The Mueller® Waterworks Product Training School is where you can learn the latest about Jones® and Mueller products, field tips, installation techniques and maintenance procedures. In this unique relaxed environment you will learn how to manage today’s complex water systems more efficiently and effectively. 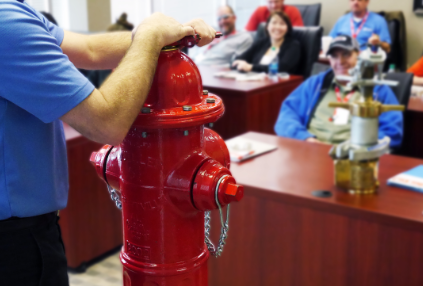 Fire Hydrants - installation tips, component details, hydrant restraint, flow characteristics, security, repair and maintenance. Gate, Butterfly, Check Valves - valve performance characteristics, selection, valve restraint, actuation, component details, repair and maintenance. Main to Meter Products - Selecting and installing corporation valves, meter setting products, service line repair, back flow prevention, insulated products. Pipe Repair Products - types of repair clamps and couplings, repairing ductile iron, PVC and PE mains. Drilling and Tapping Water Mains - direct tapping machines for ductile iron and PVC mains, saddle selection and proper use, large and small drilling machines. Tips from the Field - maintenance, troubleshooting, safety. "Excellent course, fun and entertaining. Engaging instructors. Good insight to pass onto contractors." "So glad I got this opportunity. Great experience! Would recommend to anyone selling Mueller products." "Great class with a lot of energy from instructors; makes class and tours fun!"